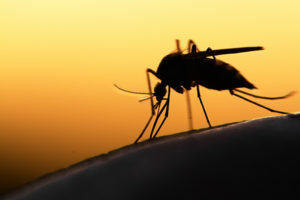 (Cherry Hill, NJ) – The Camden County Mosquito Commission regularly checks several thousand suspected mosquito breeding sites across the county. Spraying is scheduled on an as needed basis based upon the results of their surveillance efforts. Dispose of unnecessary containers that hold water. Containers you wish to save turn upside down or put holes in the bottom so all water drains out. Lift up flowerpots and dump the water from the dish underneath every week. Stock fish or add mosquito larvicide to ornamental ponds. Change water in bird baths, fountains, and animal troughs weekly. Screen vents to septic and other water tanks. Store large boats so they drain and small boats upside down. If covered, keep the tarp tight so water does not pool on top of the tarp. Do not dump leaves or grass clippings into a catch basin or streams. Do not allow water to collect on sagging tarps or awnings. Do not allow trashcan lids to fill with water. Check downspouts that are able to hold enough water to allow mosquito larvae to mature. For more information, or to report a problem, contact the Camden County Mosquito Commission at (856) 566-2945 or skeeters@camdencounty.com.